A few weeks ago I was talking to my mother, lamenting the quality of plain old cotton dish towels. 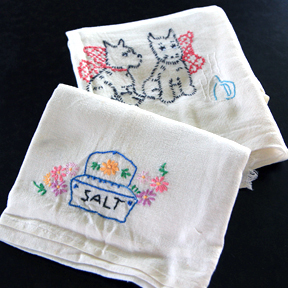 I’m spoiled, see, because way back (and I do mean way back) when I moved away from home into my first apartment, I was granted a stack of my grandmother’s hand embroidered flour sack dish towels. At first I just thought they were cute. A little salt dish, three kittens frolicking, a cheery teapot. They made dish drying an event. But over the years, as Grandma Myrtle’s flour sacks have become stained and thread bare, a few brand spankin’ new towels have made their way into my kitchen drawer. And I just need to ask, at what point in our history did dish towels stop absorbing water? The new towels seem to excel at spreading a thin film of water over the dishes. Whats more, they’re boring. Hence the grumbling to my mother. I really had no motive. It was just honest complaining. But last Friday, there was an unexpected package in the mailbox. It was soft and had a nice weight to it. Like all unexpected packages, I let it sit on the table a while before opening it. That’s half the fun of an unexpected package, after all. When my anticipation meter was sufficiently pegged, I slit the tape and (surprise!) was greeted with a gently used stack of Myrtle’s handiwork. I didn’t know there were any left after all of these years. My mom has been holding out on me. But she made up for it by sending me a “days of the week” set of towels. 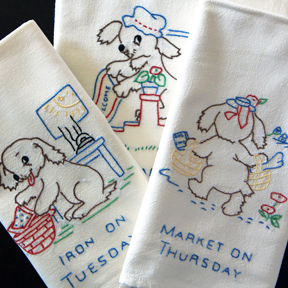 Each one features a perky dog undertaking a daily scheduled activity. There’s the market on Thursday, cleaning on Friday, and baking on Saturday (cupcakes even!). Sunday is church, of course, followed by laundry on Monday, which naturally leads to ironing on Tuesday. But that’s where the fun stops. There were only six towels in the package. What the hell am I supposed to do on Wednesday? My mother’s theory, based on the note she enclosed, is that Wednesday must simply be a day off. I do not buy this. Is it gardening? Mending? Canning? 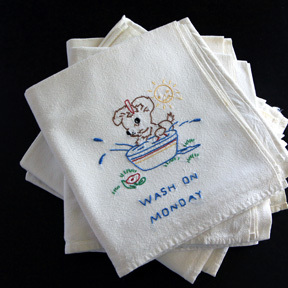 Or maybe Wednesday is the day set aside for painstakingly embroidering inanimate objects onto dish towels, using no less than three thread colors per towel. The fact that women of my grandmother’s era routinely did this stuns me. And it actually leaves me feeling a wee bit envious. How rich to have the skill, the time, and the patience to embellish something that could just as easily be left plain. And why? Just because, I’m guessing. To prove you can transform a cut up flour sack into a bonafide kitchen towel worthy of display. Finding a treasure on Etsy can’t possibly compare in the satisfaction department. I examine Myrtle’s neat, precise little stitches and feel a little gyped. I am pretty confident that my grandma’s plate was as chock full of things to get done as mine is, probably more so when you really get down to it. So I long to know how she made time for all the little “just because” things. The things you don’t have to do, but that leave you feeling better if you do. The things that put an extra little shine on our day. The things that are easy to forget about when we get busy. However she pulled it off, it seems worth exploring. Maybe I’ll rustle up one of Myrtle’s old embroidery hoops so I can make a proper towel for Wednesday. My stitching skills are dreadful I’m sure, and life would certainly forge on without it, but isn’t that exactly the point? In our age of modern convenience and instant gratification it’s nice to remember that the process can outshine the outcome. No wonder you stayed home today. You were ironing. I’m with your mother — day off tomorrow! Why yes. I’m sure I’ll be looking extra crisp and put together tomorrow. I do remember when dish towels absorbed water. Sigh. I love that you treasure Grandma’s towels Jill. I have always had her towels in my kitchens – in my first apartment too. They last forever which is probably why I still had this set. I’m sure it was one of many she gave me “jusr because”, or as shower or wedding presents nearly 50 years ago! Back in 1966 I was gifted with beautiful handmade shower gifts – pillow cases with hand crocheted or tatted edges, handmade cross-stitched aprons….it was what they did and to this day I can’t bear to use some of the beautiful things. The big thick flour sacks are no longer available – only a much smaller thin version now. I’ll be anxious to see your Wednesday creation – Grandma would be proud you’re going to try your hand at it. Who knows, maybe I was the culprit who needed a towel and grabbed Wednesday years ago. Maybe Wednesday is for blogging? My grandmother made these wonderful towels, too, but they’re gone. 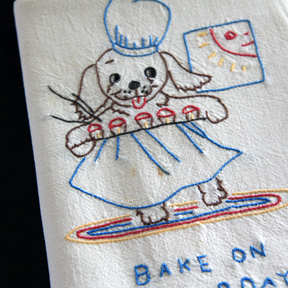 You’re right about our flour sack dish towels today. They don’t actually dry anything. Yes! We’re sounding old! Love this post. I often think how much more meaningful it would be if many of the things (tools, plates, etc) we used daily were actually made (or embellished) by us. Every object takes on so much more meaning and out home becomes filled with even more love. Like you say, drying dishes with your grandmother’s towels, completely changes the experience of drying dishes. Perhaps we should start a little needlework circle!